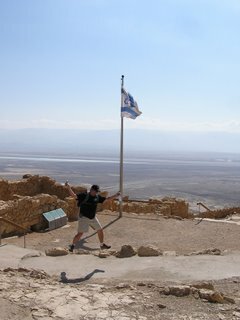 I have been leaping most of my life. 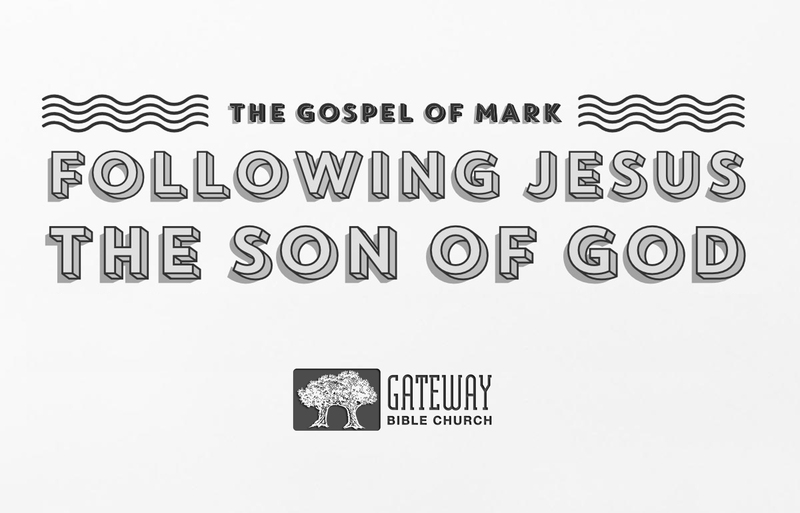 It all began in Jr. High when I was challenged in P.E. class to work on becoming a decathalon athlete. I took up the challenge and spent most of my lunch breaks, usually 1 1/2 hours in length, working on many of the events. One of my favorite events was the High Jump. Before long I would spend every lunch hours in the gym with my my P.E. teacher, Mr. Platt, working on perfecting the Frosbery Flop. 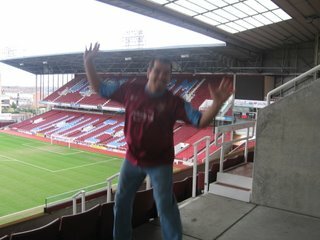 This first leap takes place at Upton Park, the home of the very best team in Soccer (Football – echem…) West Ham United. This was my first visit as a life long fan and I was given the royal treatment. Amazingly, West Ham (the Hammers) are playing Liverpool in the FA Cup Final this year. The FA Cup is the English equivalent of our Superbowl — the biggest game of the year. The last time the Hammers one it was in 1980… To be sure, if they win, there will be some more leaping going on… The picture is a little fuzzy as my trusted cameraman wanted to be with his daughter rather than with me and left me in the care of a security guard… Hey, but I was there!! Ahhhhhh. 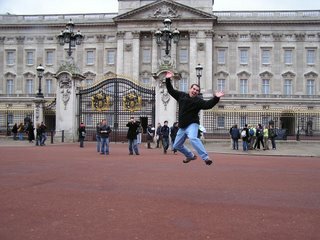 There is nothing so invigorating as leaping repeatedly in front of Buckingham Palace while multitudes of tourists are noticing your antics. You know when it is bad when they are taking your picture and are surely thinking…”Look at these crazy Americans. They think they can just jump anywhere they please. How rude! How tasteless, especially at such an important sigh.” Well, they may have a point, but it was cold and rainy, so I was keeping warm while they were freezing their…well, you know what I mean. Well, what else am I supposed to do at the sight where Jesus asked His disciples, “Who do you say that I am?” and where Peter answered, “You are the Christ, the Son of the Living God.” The spring at this location is one of four feeders to the river Jordan. This one had to be a little more consipcuous. 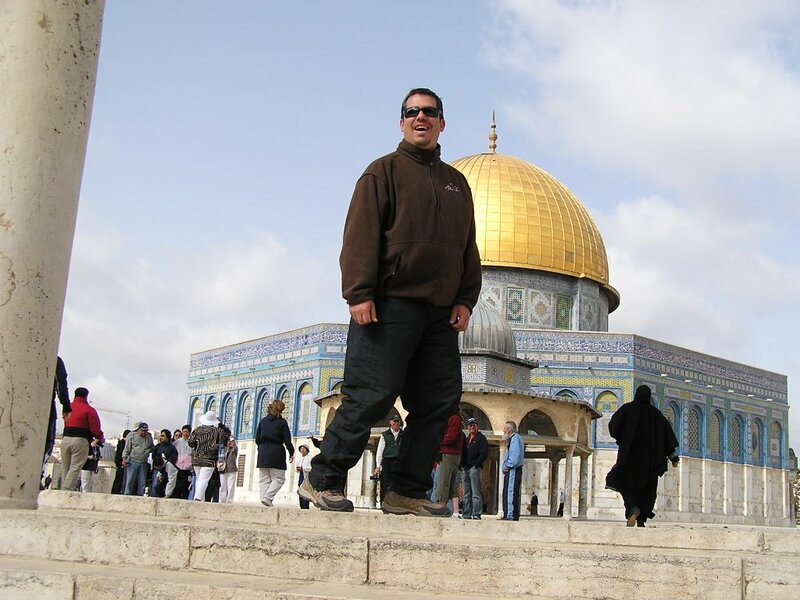 Although you can’t see me in the air, my cameraman (and associate in crime) tried to take my picture numerous times… So this is the best we could do without stirring up the Islamic bees who were keeping watch over their holy site. 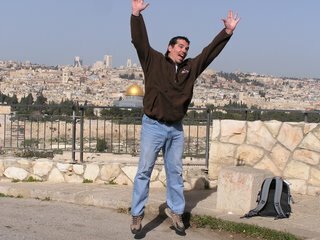 Here I am leaping over Jerusalem at the Mount of Olives. This is an incredibly beautiful sight and is the usual spot for breathtaking pictures of the City. 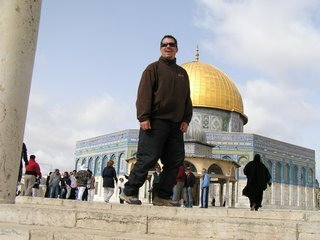 You can see the golden dome of the Temple Mount in the backgroud. I especially enjoyed walking down through the white washed tombs and then spending a few moments under an olive tree in the Garden of Gethsemany…I highly recommend it. O.K. I’ll admit it. I take this jumping thing a little too seriously, but hey, if it will put a smile on the faces of our Russian friends, then I don’t think that it’s that bad. 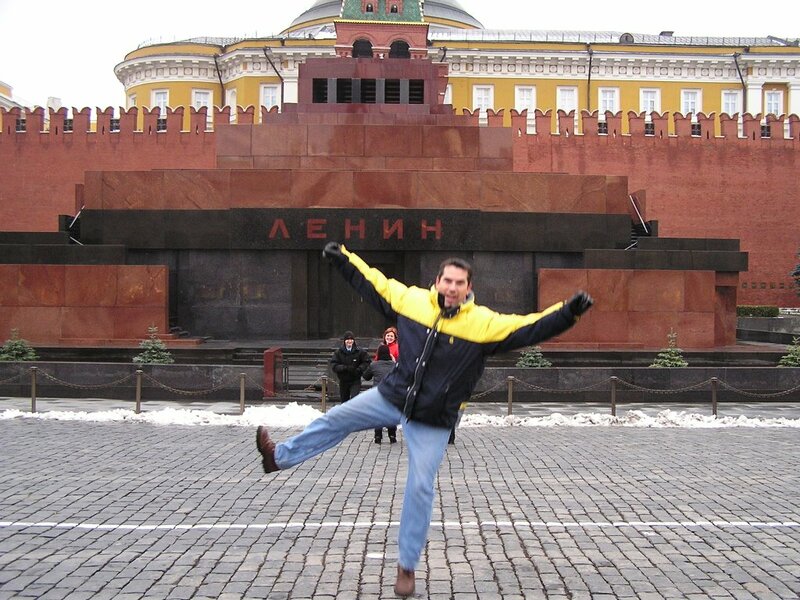 So, here are three almost identical leaps in front of significant places in Russia… This first one is in the middle of Red Square and in front of Lenin’s tomb. 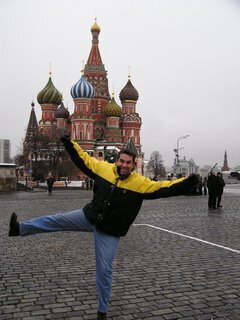 Now, what I haven’t told you is that the first time I visited Russia in 2003 we toured Moscow on “Men’s Day” which is their version of Memorial Day. Now that was really cool when we got to Red Square because there were a couple of thousand men all wearing their old Communist uniforms drinking Vodka and protesting, or better promoting the good old glory years. 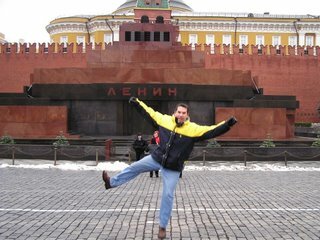 As we neared Lenin’s tomb I just felt an urge to put my hands in the air and yell, USA! USA! USA! USA! as if I were at an Olympic Hockey event between Russia and USA… Fortunately wisdom got the better of me as my yellow trimmed jacked among the drab and muddy brown and green Kossacks clearly labeled me as an outsider. It was an eary feeling, and the mass of men were definitely a little tipsy. 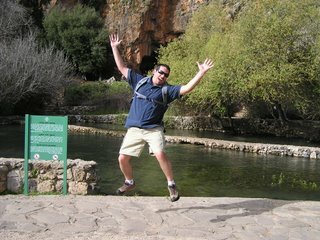 Our good guide, Andrew, gently led us out of danger that day. I want to see your leaps in another 20 years. I used to be able to leap too. Now the knee is gone and the hip is acting up. So I leap in my spirit instead. Sir, I had no idea these leaps were even ON your website…and they only add to the things I like about you 🙂 I firmly believe that leaping is a dying art and anyone who can leap at St.Basil’s AND teach scripture is good enough for me! It’s so beautiful there, it looks like a postcard even when you’re standing next to it! 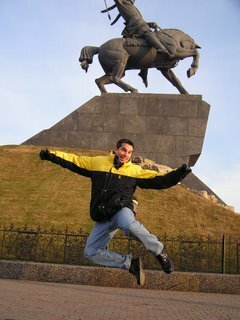 The day I went to Lenin’s tomb you couldn’t even laugh out loud without troubles…granted, I was MUCH younger and more giggly. I was able to spend a couple of weeks in Moscow, Minsk, ‘n Leningrad waaaaayyyyy back in 1985…beautiful country, beautiful people.